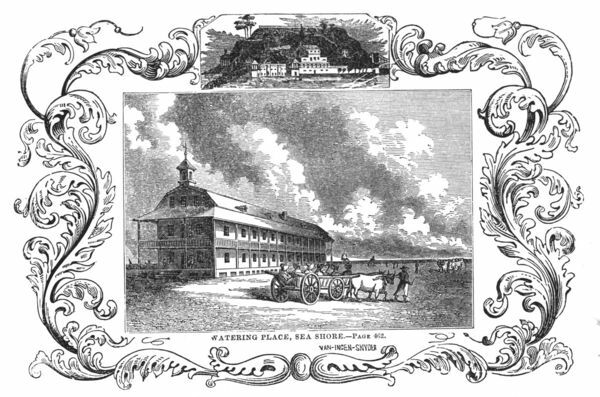 As before stated sometime during the youthful age of the meeting house, there was a yearly meeting established at Egg Harbor, which continued for a number of years, and Friends came from distant sections to the yearly meeting at Egg Harbor. Writing about Quaker Bridge, many historians suggest the reason the Friends constructed the bridge was to eliminate the numerous drowning that occurred there in the past while fording the stream. 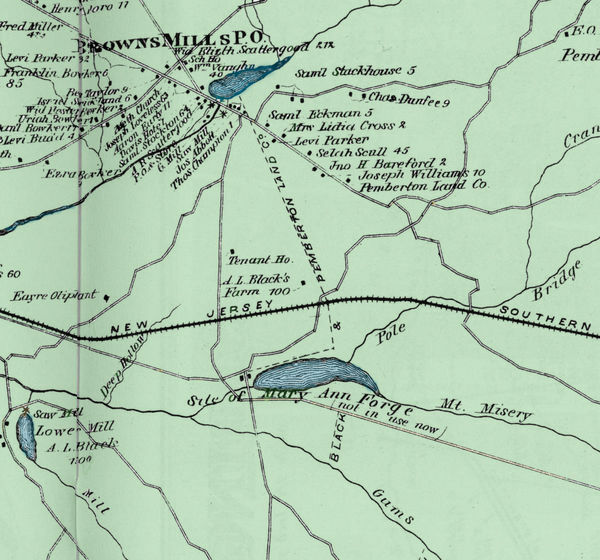 A careful read of the historical record, however, strongly suggests that these chroniclers confused and conflated stories about the Swimming Over location on the Mullica near Leeds Point with the site of Quaker Bridge. 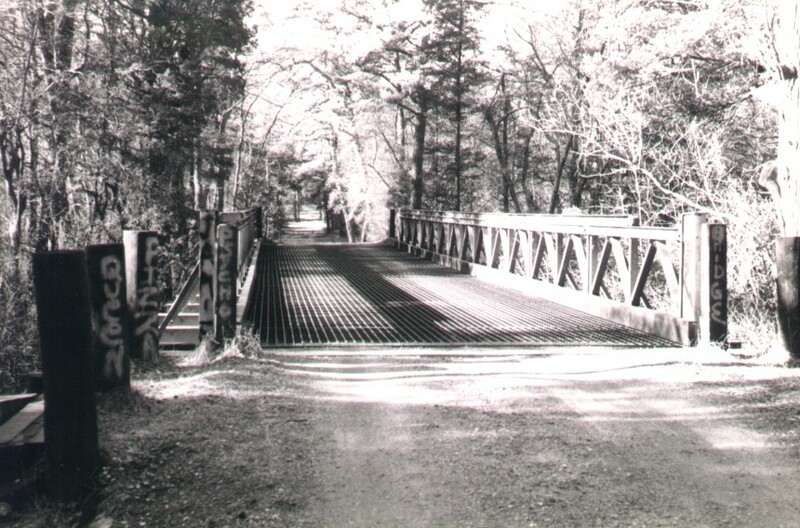 This bridge quickly became an important crossing place over the Mullica in the region. 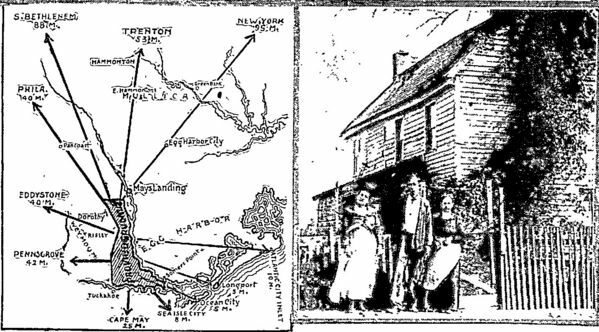 The well-worn bridle path, and former Indian trail, the Quakers used for their annual pilgrimage soon widened to become one of the main roads between Philadelphia (actually, the ferries in present-day Camden) and Tuckerton. During the American War for Independence, it seems logical that privateers used this Tuckerton Road and the Quaker Bridge, among other routes, to move a portion of their booty to the Quaker City, although I have not found any collaborating documentary evidence for such musings. We can also surmise with some certitude that highwaymen like Mulliner, Giberson, Fagan, et al. made regular runs and raids along this road to Tuckerton. The issuance of the mail contract to an independent carrier provided the impetus for inauguration of stagecoach operations between Philadelphia and Tuckerton over the Quaker Bridge route, which started operations in the same year as the opening of the two post offices. The stagecoaches and the attendant servicing needs for the horses, the drivers, and the passengers, warranted having taverns situated from two to eight miles apart. It appears for the first year the stage operated, no tavern stood between “Washington” and Bennett’s Tavern in Evesham (now Marlton), which is really too great a distance for the sake of the horses and the comfort of the people. Although stage operators did not stop at every tavern, it was very important to have such facilities properly placed and spaced. During the second year of stagecoach trips, Ephraim Cline opened his stand west of Atsion at Edgepillock. 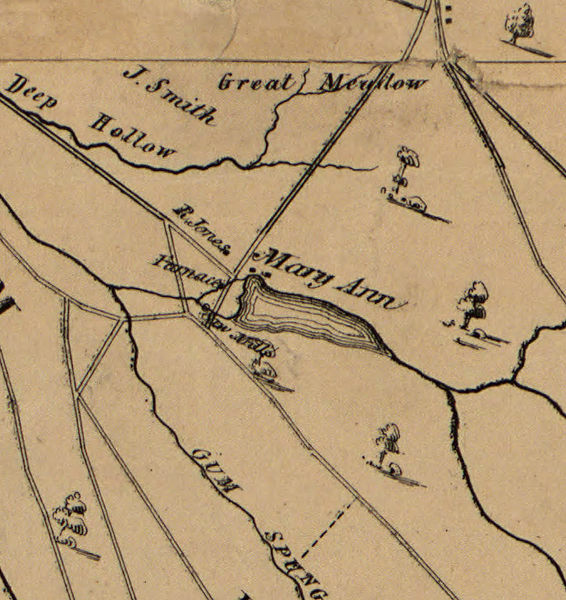 Gradually, other taverns opened along the route, including one at Flyatem, Quaker Bridge, and Mount. Arthur Thompson, the oldest son of William and Mary (nee Nieukirk) Thompson, born circa 1773. He obtained a position at the Atsion Forge upon reaching the appropriate age. On 11 May 1797, he married Elizabeth Sooy, the eldest daughter of Nicholas and Sarah (nee Sears) Sooy, who operated Washington Tavern. Arthur must have achieved a rather high level of technical acumen at the forge, for on 13 February 1802, he purchased an interest in the ironworks and the lands surrounding from the executors of Drinker and the executors of Lawrence Salter. In 1808, he then acquired a tract of land “bounding Batsto Creek north of the bridge known as Quaker Bridge, formerly the property of the Batsto Iron Works and purchased from J. 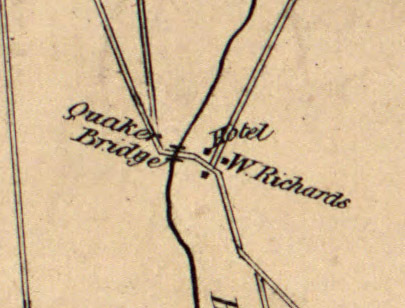 [Jesse] Richards by Sooy in 1801.” It was on this new parcel that Arthur and Elizabeth Thompson constructed the Quaker Bridge Hotel, otherwise known as Thompson’s Tavern. He must have completed the building in 1809, for he filed his first tavern license application during that year. A small hamlet of several houses soon nucleated around the tavern. Thursday, June 22, 1809. Started for Tuckerton the weather very damp—met with a smart Beau in my walk down the Ferry—he immediately joined and escorted us safe over—we bid him adieu—walked up to the house to take our passage the stage as they called it for to me it had more the appearance of an old Jersey wagon such as they go to market in but there was no use in complaining we started, nine passengers in all, the back part of the stage was stuffed full of bags banboxes without number—one poor old man about 80 years of age—the poor soul was cramed in among them to beshure he had a soft seat but the Ban Boxes they where flat enough and there contents wich where principlely Sunday Bonnets for the Tuckerton Bells—stopted at Haddonfield saw Mrs Bolton very much pleased with her—she made many inquires after Mr Wests family—he was very socible. dined at Ever Ham Pewter plates and Wooden spoons Landlady rather short very good peas and pretty good lamb-currant pie sweet with molasses Left Mr Bennet got pretty well in the Pines and heavy sand caught in a thunder storm Lightning one says O, dear, O my O I wish I was with the old man among the Ban Boxes—the stage leeked spoiled my pretty Bonnet blessed the stage and its proprietors and the old ragged curtains, arrived safe through all our troubles at Quaker Bridge, had a very good supper, clames in abundance good coffee very good beds landlady very kind, Charles complained of the rats said they bit his ear could not discover any mark must of drempt it swears he did not started next morning at daylight very pleasant ride after the rain, the driver polite he stopped several times to pick up magnolies water Lily &c arrived at Tuckerton to dine. More than a year later, an entry dated 10 October 1810 in the Martha Furnace diary records that Jesse Evans was at Quaker Bridge for the day. The principal difficulty was in keeping to the right road. Hundreds of these little roads cross each other in every direction like a labyrinth, so that it is next to a miracle if you hit the right one. We remained two days at Thompson’s Tavern, where we were very [well] entertained. About this time we found a [consider]able number of plants which were new to us, indeed there were few plants but what we found here. The Drosera filiformis and foliosa ? Ell. were abundant, as well as two species of Utricularia, one of which does not appear to be described. What pleased us more than any plant we found was the Schizea. Cooper found the first specimen. It is a singular little plant, and I first doubted whether Pursh had referred it to the right genus, but subsequent examination has convinced me that he is right. The whole of the plant which we saw was confined to a very small space. There is a small patch of it about forty-five yards from the W. end of the bridge, on the left side as you approach it from Philadelphia, and about twelve feet from the road. I have been particular to mention its locality as this is the only spot where we found [it]. We found abundance of the Leiophyllum and Hudsonia, some of them in flower. The latter plant I am inclined to think is a different species from the one which grows on the sea coast. At first sight you are struck with the long peduncled flowers of the one, and the almost sessile flowers of the other. We found two species of Eriocaulon; one common, tall and with large hemispherical head and tuft of short leaves at the base; the other smaller, with long leaves. They are both ten-striate. After we left Quaker Bridge, we fared pretty hard. Some places called taverns that we put up at were not fit for an Arab. At a place called the Ten-mile Hollow or Hell-Hollow we expected to sleep in the woods, for it was with difficulty that we persuaded them to take us in. This was the most miserable place ever saw; they were too poor to use candles. No butter, sugar, etc. A little sour stuff, which I believe they called rye bread, but which was half sawdust, and a little warm water and molasses, were all we had for breakfast. For supper I could not see what we had, for we ate in the dark. From this place until we reached Monmouth we found scarcely a single plant in flower. A specimen of the Schizea (Curly Grass Fern) referred to in the letter can be found in the collection of the Torrey Botanical Club in New York, reportedly collected by Frederick Pursh and J. Leconte, while on a trip with Dr. C.W. Eddy and C. Whitlow. Pursh claimed full credit for the find, despite being reportedly accompanied by Leconte. While various reference to this discovery carry dates of 1805 and 1808, it seems more likely that discovery occurred in 1811 based on an 1812 letter from Dr. Muhlenberg to Zaccheus Collins in which Muhlenberg writes that the Schizea was “…discovered last year by Mr. Pursh and Dr. Eddy.” The year 1811 fits much better with when Thompson opened his Quaker Bridge Hotel than does 1805 or 1808. …The writer of this article knew him [Pursh] in 1804, while he was Mr. Hamilton’s botanical gardener, and he appeared to be intelligent and zealous in his profession, but not equal to the task undertaken; the same opinion is entertained by those who knew him in New-York, at a later period, when he had charge of the Elgin garden. …Moreover, the new genera Diphryllum, Phyllepidum, Shultzia, Odeneetis, Tsotria, &c. and PURSHIA, dedicated to himself!! Published by C.S. Rafinesque, in the Medical Repository of New-York, 1808, No. 44, of which Mr. Pursh must have had knowledge, and has willfully omitted for some purpose which can only be guessed at. He has introduced in his Flora many of the naturalized plants, which form an important feature in the botany of every country, but has omitted as many more, since he has neglected the following naturalized genera [list omitted for space] and many more, most of which are enumerated by Rafinesque, in a dissertation on the naturalized plants of the U.S. in the Medical Repository, for 1811, No. 56. …It is hardly to be supposed that he was ignorant of so many additions to American Botany, of which a great proportion had been published in New-York, while he was in that city or its neighborhood…. These omissions are therefore unaccountable, unless we suppose that Mr. Pursh has omitted them in order to set off with more advantage his own discoveries, or rather to hide those which he has copied or stolen from them, that he might not be compelled to disclose the sources from which he derived such plagiaries. We are sorry to be compelled to tax this author with such despicable motives; but we do not perceive any other to which it might be ascribed, and we have abundant proof that he has concealed circumstances relating to some of the new plants, which he has taken the liberty to describe as his own, while he knew well that the first discovery, and even publication did not belong to him; he has even in some instances dared to publish them again under the very same names given them by the original discoverers, while sometimes he has concealed his pilfering under different names. It will be necessary to notice such of those daring attempts as we have been able to detect. The Drosera filiformis was discovered in 1802 by C.S. Rafinesque in a journey to the sea-shore of New-Jersey, in company with Col. Thomas Forrest, communicated in 1803 to Dr. Muhlenberg, to Mr. Hamilton, to whom Mr. Pursh was then gardener, and to Mr. Pursh himself, and published in 1808 in the Medical Repository, in 1809 in the Journal of Botany, &c. nevertheless, Mr. Pursh introduces it in his Flora, in 1814! as a new species, under the same name, stating that he discovered it in the same place, near Tuckerton, in 1805! and without noticing in the least the above circumstances. A plate of that plant, engraved by said Rafinesque, and intended to form a part of a selection of rare American plants, had been sent in 1803 to Dr. Mitchill of New-York, and is now deposited in the Lyceum of natural history of N.Y. together with many other plates of new plants. …In an excursion to New-Jersey made by Dr. Eddy, Mr. Leconte, and Mr. Pursh, a very rare new species of Schizea was discovered by Dr. Eddy; Mr. Pursh did not find a single specimen; but one was lent to him, with a positive injunction that Dr. Eddy meant to publish that species: however Mr. Pursh has published it under the name of Shizea pusilla as his own discovery. The reviewer continues with his unrelenting attack for each and every error, omission, and example of pilferage found in Pursh’s book. Hence, any statement concerning the date of discovery for the Curly Grass Fern should be taken with a healthy dose of skepticism based on Pursh’s own proclivity for changing the facts and the extant historical record of when the discovery actually occurred. Pursh himself may have backdated the discovery so he could claim the earliest, and thereby the first, harvest of the collected specimen. Quaker Bridge, over Batsto river, Washington t-ship, Burlington co., 6 miles S.E. of Shamong village, and 4 from Atsion Furnace. There is a tavern there. 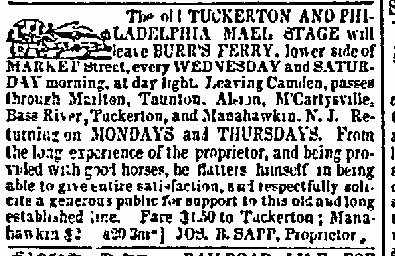 I cannot say how the mail was carried from and to Tuckerton, for some authors persist in saying that Isaac Jenkins was the first stageman between Tuckerton and Philadelphia, and that he commenced the stage business about the year 1816. But certain statements warrant me in believing, that it was before the year 1816 that Jenkins set up staging. James Hughes, of Cape May, was one of the early stage drivers of the Tuckerton stage, and many are inclined to the belief that he was one of the first who acted in that capacity. Isaac Jenkins made one trip a week, leaving Tuckerton on Monday, and returning on Saturday. It took two days’ travel each way. Based on the schedule presented in the notice, Sapp retained the single-day one-way trips that Thompson had started. 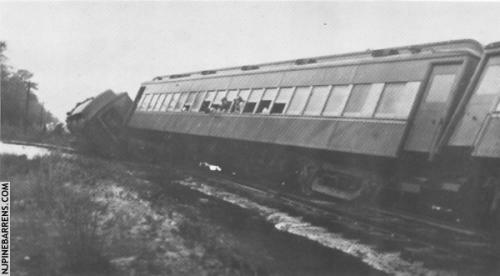 Stagecoach operations continued until rail service to the mid-Jersey coast became available. That the president and directors of the company be, and they are hereby authorized and invested with all the rights and powers necessary and expedient to survey, lay out and construct a rail road, from some point or place in the county of Gloucester, within the corporate limits of the city of Camden, not exceeding sixty-six feet in width at the surface of the road, with as many sets of tracks and turn-outs as they may deem necessary; thence to or near Quaker Bridge, in Burlington county, thence to or near McCartyville or Wading River, and thence to such a place at or within two miles of the village of Tuckerton as may be fixed on by the president and directors. 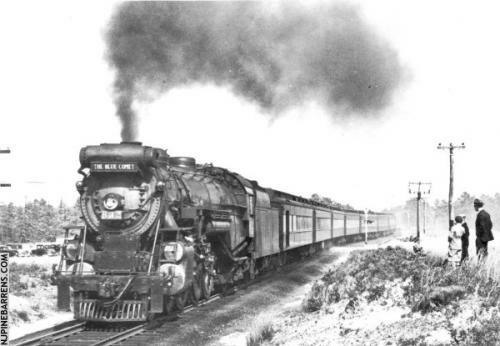 Another portion of this same enabling legislation prohibited the use of steam locomotives on the line. 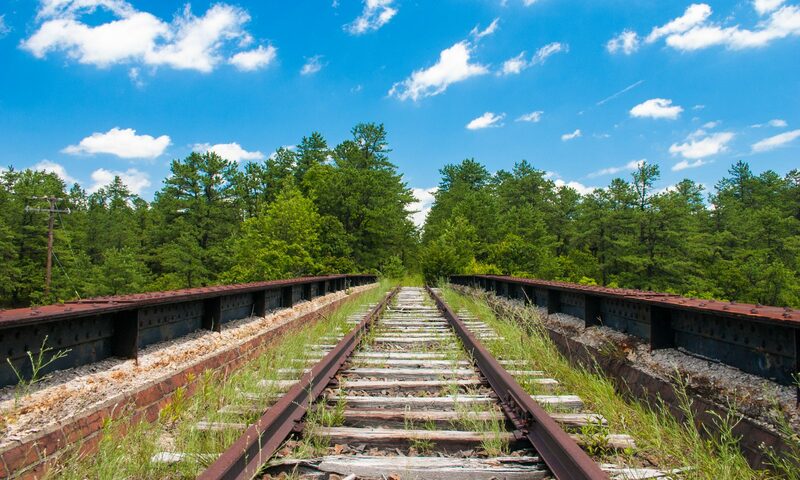 Like many New Jersey railroads incorporated during the mid-1830s, the Panic of 1837 and the ensuing financial malaise ended any hope of building the railroad. Some of the incorporators attempted to revive the charter in 1848 by receiving approval of a legislative act to extend the expiration time for the corporate charter, but between 1836 and 1848, the industrial components of the Pine Barrens had changed dramatically. Four years after this failed attempt to reenergize construction of this all rail route through Quaker Bridge, the Richards family involved itself with another railroad to the coast: the Camden & Atlantic. As an illustration of the miseries of travelling in private conveyance over fifty years ago I shall here give a few incidents of a trip I took to Philadelphia when I was twelve years of age. In the winter of the year 1829 and 1830 I went with my father to Philadelphia. As was customary in those days with such travelers as we, we started from home between 2 and 3 o’clock in the morning on a very cold morning in January. My father was very careful in all things and like the slow careful drivers of the period he was careful of his horses, so we jogged on it the dark until just as the sun arose we came to the hotel kept by Alexander Thompson Sr. Here we stopped to give the horses a bite and also to warm ourselves. I got out of the wagon and was shown into the sitting room of the hotel where there was a blazing roaring fire of pitch pine knots on the sample fire place. In the winter of year 1829 I, then being 12 years of age, went to Philadelphia with my father. He went in his own conveyance and we traveled about as other people did in their own carriages. People of those days, especially farmers, were careful drivers, none of them being of the Jehu class. Father was noted for his carefulness in all things and this being the case he was a careful driver. We as most other such [travelers] eat our breakfasts and started from him about 2 o’clock on a bitter cold morning in January and did not stop anywhere until we reached the Mount Hotel 15 miles from Tuckerton and then the sun was just rising. My feet were extremely cold. I got out of the wagon and went into the hotel where there was a roaring pitch pine fire in the large fireplace, and before this fire I warmed my feet., but afterwards found they were considerably frosted and continued to worry me all winter. By virtue of an Order of Sale, made by Joseph L. Morton, Esq., one of the Judges of the Court of Common Pleas of the County of Burlington, the subscribers will sell at Public Vendue, on SATURDAY, the Eleventh of September next, between the hours of 12 and 5 o’clock in the afternoon of said day, at the Hotel of William Davis, in Mount Holly, all that Farm and Tract of Land, Whereof Jonathan Crammer died seized, situate in the Township of Washington, County of Burlington, on the road from Quaker Bridge to Tuckerton, and known as “The Mount Tavern Property,” containing about THREE HUNDRED & TWENTY ACRES! Of which about 100 acres are Arable land, the remainder in young Timber.—The Improvements consist of a very large and substantial Frame Dwelling House, Barn, Crib-house, Wagon-house, Horse-sheds, &c. This is a very desirable Property, and is worthy the attention of persons wishing to make a profitable investment of their money. Sale to commence at 2 o’clock, P. M. Conditions at Sale. RICHARD B. NAYLOR, CHARLES N. LAMB, GEORGE DEACON, Commissioners. Aug. 10, 1869. Some time since we published a letter from Port-au-Prince, stating that a German, named John Muller, had confessed to the American Consul that he had murdered a man about six months ago in Burlington county. Yesterday (Monday) we published a brief account of his arrival at Philadelphia and examination by G.S. Cannon, Esq., Prosecutor of the Pleas of Burlington, but as it contained many errors we publish below the correct account of the examination. Mr. Cannon, having been telegraphed for, went to Philadelphia and had an interview with the prisoner. The latter repeated his confession, which was in substance as follows: In February last he was at work at wood chopping at a place called Quaker Bridge, in Washington Township, Burlington county. His employer was Squire [William H.] Sooy. It seems that there was a German living in the neighborhood named John Meyer, who treated his wife very badly. She had left her husband on one or two occasions, but the latter had forced her to return and again live with him. Her case excited the commiseration of the prisoner and a fellow workman named Gottleib Mulheiser and the two agreed to give the woman some money to assist her in getting away from her husband. This, Muller says, they did, and the woman went away on the stage. Meyer and the prisoner worked together in a shanty in the pines, and for some reason Meyer suspected their agency in the disappearance of his wife. The husband went to their cabin, broke open the door, and demanded his wife. A squabble took place between the parties and the two friends were more than a match for the infuriated man. This fight was not attended with any serious results. Several other affrays growing out of the same cause occurred at subsequent periods. Finally, one day some time afterwards, Muller and Meyer met at a cabin kept as a store by Squire Sooy, the old quarrel was revived and Meyer struck the prisoner over the head with a small stick. The blow was not a serious one. The parties clenched, and the prisoner struck his adversary several severe blows about the temple with his fist, Meyer fell and appeared to be dying, when Muller became frightened, went to his own cabin, got his clothes and money, and eloped to New York, from whence he sailed to London. There was no person present at the time of the final fight. In London the prisoner met with a man named Charles Brown, whom he had known in Burlington county. Brown told him that Meyer was found dead, and that Mulheiser had been arrested on the charge of murdering him, and that he was then in prison. From London Muller went to Port-au-Prince, and while there he suffered great anguish of mind at the reflection that his friend was imprisoned for an offence of which he was entirely innocent. Muller accordingly determined to make a confession, which he put in execution and requested the American Consul to send him to the United States for trial. The prisoner is but 23 years of age. He says he first came to this country about three years ago, and that he worked for Squire Sooy a year before the fatal event. 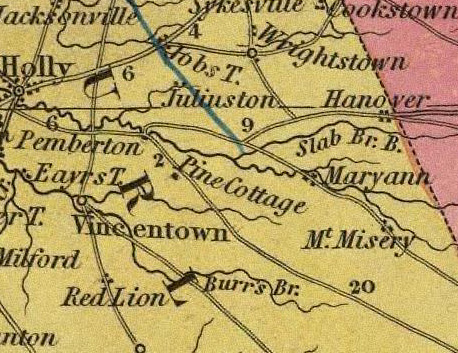 Mr. Cannon has sent the sheriff down to Washington township, to gather such facts as may bear upon the case, and we shall probably know more of it in a few days.— At present Mr. Cannon has no knowledge that such a murder was committed, and it seems probable that Meyer may have recovered after Muller fled. We stated in our last paper that Sheriff Pancoast had gone down to Washington township, to obtain from William H. Sooy, Esq., what information he could relative to John Muller, the self-accused murderer, and his victim, John Meyer. Mr. Sooy has no recollection of Muller ever working for him–but as he has had so many Germans in his employ, and they frequently pronouncing their names so entirely different from what Americans would, it is not unlikely that Muller may have been among the number, and more particularly from the fact that he seems to be well acquainted with the individuals and transactions connected with that locality. Mr. S. states that Meyer and Mullheiser worked for him, and both of them left the neighborhood about a year ago. The cause of their leaving was the difficulties that existed between them. Meyer, it was alleged, ill-treated his wife, and Mulheiser interfered to prevent such conduct. This caused considerable jealousy on the part of Meyer and he determined to have revenge. For the purpose of punishing Mulheiser, perhaps intending to kill him, he one day, armed himself with a gun and knife, and proceeding to his cabin, broke open the door, when Mullheiser seeing the formidable appearance of his antagonist, jumped out of the window and fled. He immediately procured a warrant for Meyer and had him arrested. A number of the workmen then stepped in as peacemakers and succeeded in settling the difficulty between them. They both, however, left the premises soon after. Meyer visited the place a month or two ago, and Mr. Sooy thinks he is now employed at Jackson Glass Works. Mullheiser had been at work for Mrs. S. sometime, and when he desired to leave, there was upwards of a hundred dollars coming to him. It not being convenient to pay the full amount, Mr. S. gave him his note for sixty dollars. Nothing further was heard of Mullheiser, until about three weeks ago, when he came back and obtained the money for his note. He stated that he had been at work on the Erie railroad. Such is the substance of the information obtained by Sheriff Pancoast. Mr. S. says that Muller, the prisoner, may have been concerned in the difficulties in question, but he has no recollection of any such person, neither has he his name upon his books.–Many persons are of the opinion that, being familiar with the quarrels between Meyer and Mullheiser, he invented the story of the murder for the purpose of getting a free passage back to the United States. DEATH OF THE PRISONER. All further proceedings in the case are stayed by the death of the prisoner. As was feared at the time of his committal to prison in Philadelphia, the attack of typhoid fever with which he was then suffering, has proved fatal. He died on Tuesday morning. A short time before his death, he conversed freely with Mr. Farquhar, one of the Prison Inspectors, and related to him something of his past history. It seems that after his escape from a Russian vessel at Port-au-Prince, he lay in the woods two weeks before he applied to the American Consul. It was at this time that he contracted the disease which terminated his life. He stated that his parents reside in New York. He had a Bible, which he always kept at his side. There is a story about Quaker Bridge that appear in Cornelius Weygandt’s book, Down Jersey, but I will not reproduce it here for fear of infringing on the copyright. I would recommend you read the story as in some ways in mimic the information just preceding this paragraph. 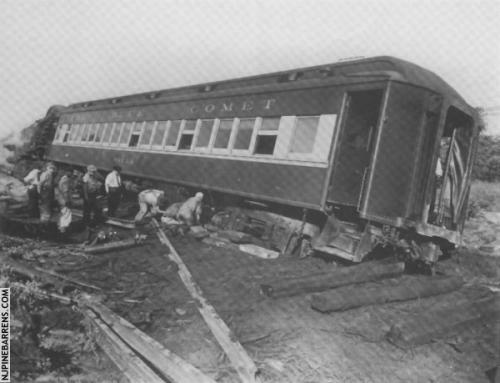 Also, Arthur D. Pierce’s work, Iron in the Pines: The Story of New Jersey’s Ghost Towns and Bog Iron contains an entire chapter titled, “Quaker Bridge to Washington.” In this section of his book, he tells the tale of the white stag that saved the lives of those in the stagecoach from certain death when the Quaker Bridge washed out. Again, the current copyright on Pierce’s book prohibits me from providing the story in this Quaker Bridge article. 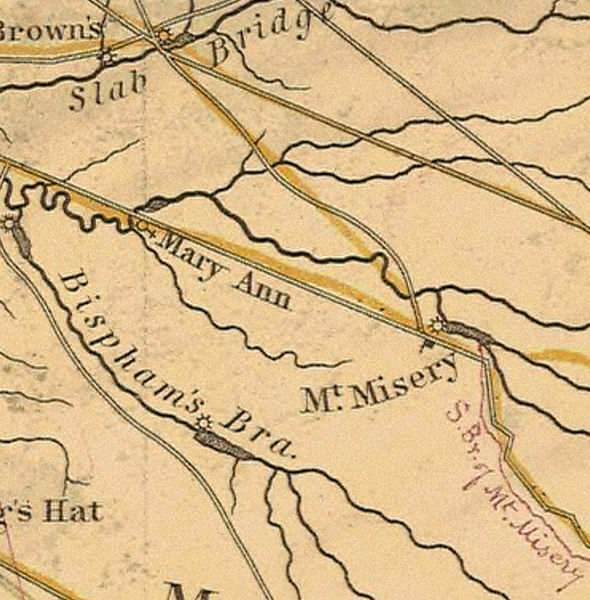 Benjamin Jones purchased this tract from John Black in May 1827, and a few years later built the Mary Ann Fore on Mount Misery Run about three miles southeast of New Lisbon. Its two hammers were supplied with pig iron from the Hanover Furnace. When Samuel H. Jones and Richard Jones purchased the holdings of their father, Benjamin, in 1846, this tract was included in the sale. Its subsequent history is closely interwoven with the many financial difficulties of the Jones brothers. In 1851, Samuel H. Jones gave a mortgage to Anthony S. Morris, trustee, for one-half of the Hanover Furnace Tract, Mount Misery Tract, Mary Ann Forge Tract, and several other tracts, which is the first recorded notice of the forge that has been located. The forge itself continued to be operated until late in the Civil War, and on a map made in 1877 is marked “not now in use,” and today the only trace of the old plant is a pile of forge cinders, the dam and sheeting. The principal products of the forge were first bar iron. In later years, wagon axles and wagon tires were made on an extensive scale. Although the Jones family continued to operate Hanover Furnace until 1864, they also established a new ironworks at Florence, on the Delaware River during 1857-1858. Most sources indicate Mary Ann ceased processing Hanover iron sometime in the early 1860s. At some point, forging operations likely shifted to the Florence facility and Mary Ann became superfluous. The 1861 division of the vast Jones family land holdings left Richard Jones with the lower half of the property the “Marian Forge” and 25,145 acres. 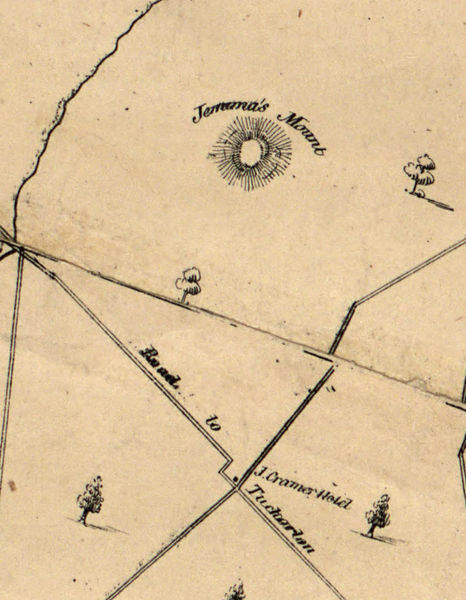 A member of these forums is a descendent of the Jones family and possesses an original edition of the published map that depicted the Jones’s expansive landholdings within the Pines. Mount Misery brook, at New Lisbon, will give for 9 months 5.6 horse-power per foot fall, and about 9 feet fall could be developed, or 15 feet by eliminating the power at Lower Mill. At the site of the old Mary Ann furnace there is 8 feet fall not at present in use. The water-shed is 38 square miles, and the available power 2.85 horse-power per foot fall. Just above this, at Mount Misery, a saw-mill was erected as early as 1723. Indeed, many of the sites on the Rancocas date back to about the beginning of the 18th century, and one as early as 1680. An important power was built at Pemberton in 1752 to operate a forge, saw and grist-mill. Mary Ann Furnace was a favorite trip. It was about 5 hours up stream from Runaway by canoe and three hours back. By foot it was about two hours each way. It was constructed in 1793 and produced iron from bog ore. An artificial lake provided power to work the furnace bellows and operate hammers to pound the molten iron to remove impurities. I have not found any record of how long the furnace operated, but it probably closed down in the 1840s when the iron ore and coal in Pennsylvania put the inefficient bog ore furnaces out of existence. When we first visited the site, all traces of the furnaces had disappeared, but most of the dam was still in place. A few lumps of slag were the only evidence of the once prosperous furnace. Near by was delightful pine grove where we had many happy picnics. Swimming in the stream above the broken dam was always refreshing. The booklet includes several photographs of the ruins at Mary Ann when these explorers visited the site during the 1920s and 1930s. 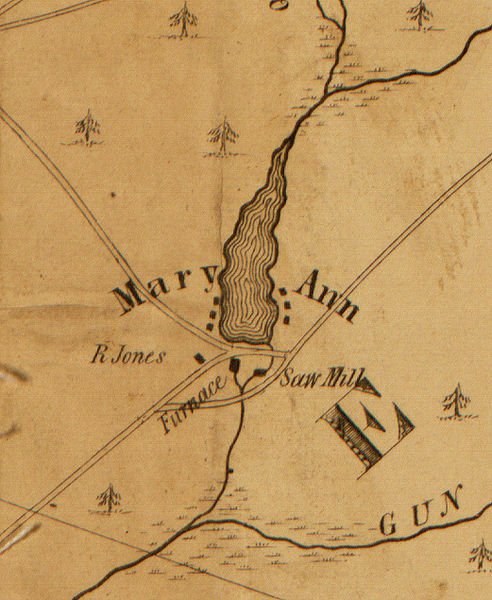 At some point in time following the cessation of ironworking, the area around Mary Ann Forge became dedicated to cranberry production. A year before the United States entered the First World War, the Bethlehem Steel Company quietly purchased vast quantities of land southwest of Mays Landing for building a new proving ground. When the country did declare war, Bethlehem altered its plans and constructed BELCOville, named for the Bethlehem Loading Company. Here is the story of what Bethlehem planned to do with their land along the Great Egg Harbor River during 1916 and how the company already owned the land when it built the shell-loading plant and associated village to house the workers. All spelling and punctuation match the original article. My apologies for the quality of the images, but I did my best considering I derived them from a microfilm printout. Imagine a tract of land covering Philadelphia county from League Island on the south to Mount Airy and Bustleton on the north; bounded on one side by a brackish river, capable of accommodating fair-sized shipping, and susceptible of being dredge to accommodate larger, bounded on the other side by a superb automobile road, running for miles through devastated forest land: the space between river and sea filled with forests of aromatic scrub-pine, stunted oak and cedar, opening out here and there into arid spaces like a southwestern desert and closing in at others to dense thickets where none but the deer have penetrated. This will give some idea of the extent of territory which will be covered by the new proving-grounds of the Bethlehem Steel Company, for heavy ordnance, ranging from May’s Landing, New Jersey, south to the Great Egg Harbor Bay. The government, it is asserted, will not have any official part in the use of this proving-ground. The Bethlehem Steel Company did not take Washington into its confidence in planning for the vast land purchase—so vast that 250 deeds were recorded at the county offices at May’s Landing, and the signatures of more than 1000 persons, sought in every State in the country, into the greatest ordnance grounds in the world. The significance of the purchase, which has been quietly going on for eighteen months through real estate agents, is hardly yet felt in South Jersey. May’s Landing, a quiet old country town of 2000 souls, is to be transformed into a great industrial centre, and its inhabitants, perhaps, changed from quiet householders who have gone on from generation to generation in the contentment that comes midway between wealth and poverty, into keen speculators and moneymakers. The government, it is said, has been aware for a long time, of the quiet purchases of land along the Great Egg Harbor River, but has taken no special interest in it. If the new proving ground turns out to be satisfactory, the government will probably make its tests of armor plate there, but these tests, it is indicated, will be of Bethlehem products alone. Miles of forest-lands will have to be cleared of their heavy, sweet-smelling growths—stripped clean down to the sand that in South Jersey underlies everything. Buildings here and there—and there are few enough of them—will be used for a time to house the laborers who will be drawn into May’s Landing as soon as the work of putting up the new buildings of the steel plant begins. The land is wonderfully flat from Mays Landing to the sea. The water tower at Mays Landing, visible at a distance of nineteen miles, it is said, first directed the attention of engineers to the possibilities of the land. Farm after farm, meadow after meadow, and tract after tract of stubborn woodland passed quietly into the hands of the purchasing agents at prices which seemed liberal to the South Jersey people. Then the news got abroad and values went up by leaps and bounds. Six thousand six hundred dollars, it is said, was paid by the company through its agents during the last week for a farm of 110 acres, which had several times been sold for taxes, and which had been valued by neighbors at $800. Six months ago a tract of 200 acres was offered to a Mays Landing citizen for $175. It cannot now be bought for money. Meanwhile the inhabitants of ever seashore resort within twenty miles are wondering what the danger from gunfire or stray shells will be. The government experts declare the danger will amount to nothing. It is considered unlikely that inhabitants will ever be disturbed by the explosion of a sixteen-inch gun. Screens will be built which will muffle sound as well as prevent the scattering of projectiles. And the range of these, as a rule, is calculated beforehand with wonderful precision. The ground at present acquired is situated on the east bank of the Egg Harbor River, which it follows for a distance of eighteen tortuous miles into the Great Egg Harbor Bay, into which Longport, below Atlantic City, thrusts a projecting tongue. The distance, as the crow flies, from Longport to the lower edge of the proving grounds, will not be more than five miles. From the Great Egg Harbor Bay the ground extends in a more or less westwardly direction along the Tuckahoe, or locally, the “Tuckahoe” River, as far as Tuckahoe and Corbin, the Philadelphia and Camden of the district. It then extends northwardly through the little hamlet of Estelville, which it has practically absorbed, as far as the Weymouth road, at Dorothy, and thence back to Mays Landing. It has roughly the outline of a human foot and ankle seen in profile. South Jersey is not looking for its “first chance,” but for a real regeneration through the establishment of the proving grounds. For back in times almost Revolutionary Mays Landing was an active place. Seagoing vessels were built there, and the wreck of the last of them now lies in the north sands of the Egg Harbor River, just below “Goose Point.” At Weymouth, no great distance away, were iron furnaces which used the “bog ore” of the swamps and got its power for blasting from nearby streams. The cannon which until very recently were used in such quantities along Delaware avenue at street crossing to fend off wagon wheels from the pavement were cast Weymouth in 1812. Distances from seashore resorts, as well as from labor-producing communities are being figured out by Mays Landing property-holders. Although it is considered unlikely that many men will be taken on at once they will have to be provided for, nevertheless. 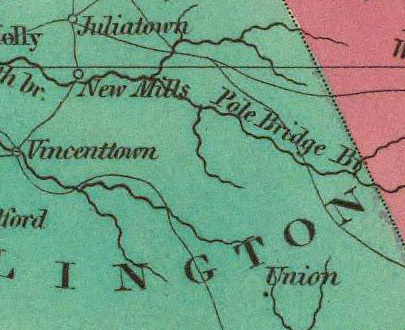 The new tract is eighty miles, in a straight line, from South Bethlehem, where the purchasing company’s chief plant is situated; forty miles from Philadelphia, and forty-two from Eddystone. Trenton is about 53 miles, New York about 95. The Atlantic City inlet is about 10 miles off, Ocean City half that distance from the nearest boundary; Sea Isle City is 8 miles and Cape May 25. The navy proving station is at Indian Head, Md. The army’s proving station is at Sandy Hook. There have been occasional complaints from residents of these neighborhoods, but they have been rather infrequent. The only time there has been an accident in recent years around Indian Head was when one of the first 16-inch guns of the navy was being tried out there a month ago. The firing of one shell was considered a sufficient test of this latest gun in the possession of the United States Government. There is a 16-inch gun at the fortification of the Panama Canal and there is to be another at the other end of the canal, but the one tested at Indian Head was for one of the new battleships and was the first ever tested. Even the experts of the army had not realized the tremendous force that the new gun would have. They had obtained a large section of the thickest and toughest armor plate that has ever been developed. Behind that was sand pile as large as an ordinary hill. With a report that could be heard for miles around, one shell was fired. It went through the bulwark, through the sand pile. Weighing more than a ton, the enormous monster of destruction hurtled through the air, finally plunging downward at an of forty-five degrees into the kitchen of Mrs. Mary Swann, wife of one of the workmen who had helped load the gun. Almost invariably, however, the experts know what to expect, and on the range provided by the Bethlehem Company, eighteen miles in length and six in width, no similar accidents would seem to be possible. Mrs. Swann and her children had a narrow escape, but were not even scratched, because they were in the front of the house. The Bethlehem Company has evidently taken precautions against having such near neighbors. 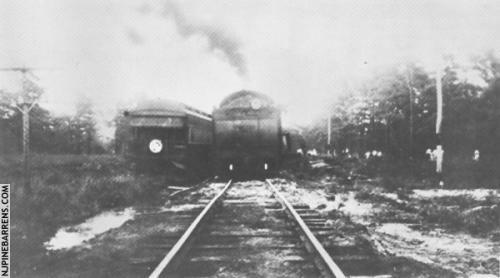 Both Captain Clark, of the Ordnance Bureau of the Navy, and Colonel Hoffer of the Ordnance Bureau of the army, said in Washington that they had received no information with respect to the development of the proving ground at Great Egg Harbor River. Colonel Hoffer said the government would naturally continue to use its own proving grounds for official tests, but that whenever a private concerns furnished proving ground facilities, it was customary that the test should be made there for the sake of convenience of both parties. Other officials expressed the opinion that the Bethlehem company had expanded to the point where it needed a large proving ground, not only because of the big European contracts for guns and ammunition, but also because of the enlarged army and navy programme adopted by Congress. All the munition and armor plate companies are aware that the needs of the government for armor plate will be trebled, if not quadrupled under the new building programme. The government now manufactures all its large guns at Waterliet, N.Y., and at the Washington Gun Factory. There is some expectation that private contracts may be awarded. It is probable, however, that most of the testing at the Bethlehem proving grounds, so far as the government is concerned, will be with respect to armor plate. It is possible that some of the government’s twelve-inch guns may be tried out there in the future, but there is no likelihood of a 16-inch gun ever being tested there. It would be easier to move the armor plate to a point nearer where the enormous gun to be tested happens to be constructed. It is unlikely, therefore, that the residents around the new proving ground of the Bethlehem Company will ever be disturbed by the tremendous explosion of a sixteen-inch gun. All sorts of smaller guns, however, doubtless will be tried out. The English used fifteen-inch guns against the Dardanelles. Now they are installing eighteen-inch on some of the ships. The largest contemplated for the American Navy are the sixteen-inch guns. “The heaviest armament at each of the Panama Canal consists of a sixteen-inch gun. These are the largest weapons in the possession of the United States, and perhaps the largest in the world. Each gun is fifty feet long and weighs 184,000 pounds. At an elevation of forty-five degrees the range is over twenty-four miles, but as mounted the range is something over eleven miles. The projectile is six feet long, weighing 2400 pounds, and containing 140 pounds of high explosive. “The charge is 670 pounds of smokeless powder, the explosion, of which causes a pressure of 38,000 pounds per square inch. The muzzle velocity of the projectile is 2250 feet per second, or 1500 miles per hour, and the muzzle energy is 84,000 foot tons. The shell will penetrate any armor plate in existence at a range of eleven miles. At this distance the water line of a ship would be ninety feet below the horizon. “The secondary defenses on each side of the canal consist of a six 14-inch guns, six 6-inch guns, sixteen 12-inch mortars and eight 4.7-inch howitzers. The mortar shells have a range of 20,000 yards, or over eleven miles, each shell weighs from 700 to 1046 pounds, and carries from 60 to 120 pounds of high explosive. At extreme range the shell reaches an altitude of over eight miles, it target being the deck of the hostile warship. “Recent reports from Europe tend to show that both the British and German navies are preparing to build or have built guns of even heavier caliber than those in use on the Panama Canal. According to apparently authoritative reports, the English Admiralty has tested and is preparing to adopt an 18-inch gun for mounting on British dreadnoughts under construction. German ordnance experts, it is understood, have perfected a gun of 17-inch caliber. “Following the great naval battles fought off the Dogger Bank and near the Falkland Islands in the present war, the tendency toward heavy ordnance became marked, as it was the lesson taught by these battles that the smashing power of the big gun at long ranges was the decisive factor in winning naval engagements. The fact that hits can be scored repeatedly at 18,000 yards, not in carefully preparing target shooting, but under actual battle conditions, has stimulated the ingenuity of big gun experts to the limit. It is estimated that nearly a hundred deer remain within the boundaries of the new proving grounds. Wild life is abundant. Access to the interior woods is difficult, automobiles refusing to plow through the heavy sand. Mosquitoes breed in the fresh water creeks and runs in the upper part. Below, in brackish water, they are less abundant. Extracted from Village Improvement, publication of the Moorestown Improvement Association. Vol. I, No. 10, September 1905, pages 2-3. Camp Kenilworth is located on Kenilworth Lake on the edge of the pines, about three miles south of Marlton. There is, perhaps, no more desolate spot in this section of New Jersey, yet it possesses for the lover of nature a charm that is almost indescribable. I recently spent two weeks in the camp with my family, and I can say with all truthfulness that I never spent a more profitable or more enjoyable vacation. To the business man whose brain is weary from the constant strain of business cares and responsibility, and to the housekeeper run down under the strain of household worries, it offers opportunities for rest and recuperation not to be found at our better-known and more popular resorts. Indeed, as modern life becomes more and more complex, it is the more necessary for us at times to avoid “the madding crowd” and seek “nature’s wilds” for rest and inspiration. The Jersey pines have been ridiculed from time immemorial, yet they possess a beauty peculiarly their own. Perhaps a poet will arise some day to sing their praises and interpret for us their message of quiet restfulness. Seated in retrospect on the bank of Kenilworth Lake I find it difficult to describe my surroundings or to express in words my love for this spot far removed from civilization. Before me lie the quiet and peaceful waters of Kenilworth Lake, in which during the morning and evening hours are mirrored the artistic pines that fringe its borders. At the upper end of the lake “Lovers’ Retreat,” a small island on which a rustic pavilion—almost hidden by vines and shrubbery—has been erected, adds an artistic touch to the outlook. Turtle log, in the foreground, jutting out into the lake, on which not infrequently may be seen two or three immense turtles, is a point of interest to the old as well as young. The lake is, perhaps, one-third of a mile in length, and is fed by a little stream known locally as “Back Run,” whose waiters are clarified by their long journey through the cedar swamps and pines. The lake offers many attractions to the lovers of bathing and boating, and at feeding time the elusive pike rippling the surface of the water tempts the disciple of Isaak Walton. At sunset the lake appears in its greatest glory. Its waters sparkle with the rays of the departing sun, and the glories of the sunset, even to the perfect coloring of the clouds, are mirrored in its depths. This picture, perfect in every detail, was equaled only by a moonlight scene during my stay when the heavens, illumined by myriads of stars, were reproduced in the waters of the lake. The milky way, the big dipper, and other beautiful constellations were perfectly pictured, and occasionally a shooting star, like a flying gold-fish, dashed through the water. The camp is located in a clump of pines on the bank of the lake. Near the water’s edge a large tent, fifty feet in diameter, serves as a pavilion, and is well supplied with comfortable chairs and hammocks. A little stream, part of the overflow of the lake, flows under one edge of the tent, and the music of the flowing water lulls us to sleep even in the daylight hours. A water-wheel, rudely built yet artistic, with its constant motion, reminds us sufficiently of the busy world outside to enable us to enjoy more fully the quietness and restfulness of our surroundings. The sleeping tents, fifteen in number, are pitched in the form of a horseshoe just back of the large tent, and within the circle thus formed a camp-fire of pine logs is built each evening. The camp-fire is the event of the day. Around it each evening the happy campers draw their chairs, and with constant flow of jest and story and song pass the evening hours most pleasantly. There is a fascination in a log-fire in the woods, beneath the blue canopy of heaven, which alone can be felt—it cannot be described. Long after most of the campers had retired I would sit with a few congenial spirits and enjoy its fascination. Song and story had ceased, and few words were spoken, yet there seemed to emanate from the glowing embers a spirit of fellowship which drew us together even though we were strangers to each other. A description of the camp would be incomplete without a tribute to our jolly host, Clayton H. Brick, and to the “Kenilworth spirit.” To a large extent the one inspired the other, for our host was tireless in his efforts to promote the happiness and comfort of his guests. At times the campers lapsed into a freedom of manner and speech that would not be acceptable in the “drawing-room,” yet a spirit of brotherly kindliness and unselfishness pervaded the camp which each one of us can with profit keep with us on our return to the ”drawing-room” or business office. Here is a short account of a trip to Edgepillock or Brotherton in 1892 by the famous “J.W.” All spelling and grammar retained in this transcription from the original published account. Extracted from The Friend, Vol. LXVI, No. 6, Seventh-Day, Ninth Month 3, 1892, pages 46-47 and Vol. LXVI, No. 7, Seventh-Day, Ninth Month 10, 1892, page 51. Through the kindness of a friend residing near Medford, New Jersey, an opportunity was furnished, on the 18th of Seventh Month last, to visit the old Indian Reservation at Edgepelick, in Burlington County, situated a few miles S. E. of Medford, on the waters of Edgepelick Creek, a branch of Springer’s Creek, which is a tributary to the Batsto River, whose waters enter Great Bay on the sea coast, through the Mullica River, into which it empties. As Edgepelick was one of the last resting places in the State for the New Jersey Indians, a short historical narrative may properly introduce a description of our visit. As the number of white settlers increased, tract after tract of land was purchased from different Indian chiefs. These were not always contiguous to each other, but would be described in the deed by natural boundaries, such as the head waters of certain streams, etc.,—which left intermediate and undefined patches, to which the Indian title had not been extinguished. To satisfy the Indians, and remove any cause of dispute, at a treaty held at Easton, Pa., in 1758, the commissioners for New Jersey purchased of the Minisinks and Wapings the title to all the patches of land in northern New Jersey, which had been before unsold, for $1,000, and a similar purchase was made of the lands in the southern part of the province. 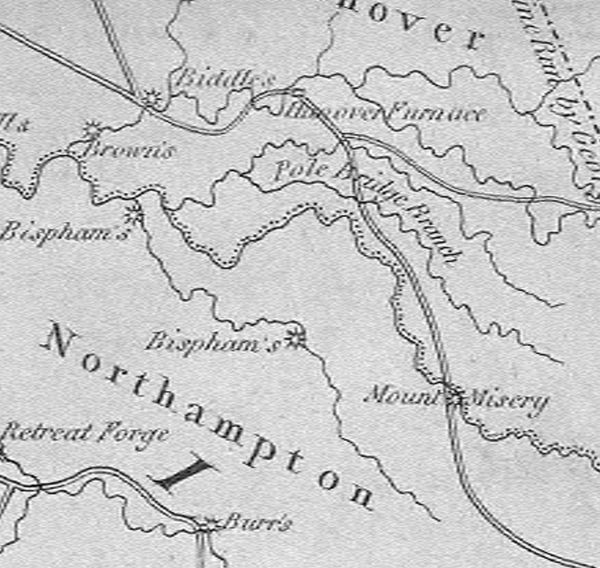 “In consequence of the expectations given the Indian inhabitants, the commissioners, with the consent of the Indian attorneys, purchased a tract of upwards of 3,000 acres, called Brotherton, situated in Burlington County, in which is a cedar swamp and saw-mill, adjoining to many thousand acres of poor, uninhabited land, suitable for hunting, and convenient also for fishing on the sea coast. The deed was taken in the name of the governor and commissioners and their heirs, in trust for the use of the Indian natives who have or do reside in this colony south of Rariton, and their successors forever, with a clause providing that it shall not be in the power of the Indians, their successors, or any of them, to lease or sell any part thereof; and any persons (Indians excepted) attempting to settle there, to be removed by warrant from a justice of the peace; no timber to be cut but by the Indians, under penalty of 40 shillings fine for every tree. The Indians, soon after the purchase, removed to the settlement, and there remain (A.D. 1765) to their satisfaction, having their usual means of living very convenient. They were assisted by the government in their removing and buildings. There are about 60 persons seated here, and 20 at Weekpink on a tract formerly secured by an English right, to the family of Henry Charles, an Indian Sachem.”—Smith’s History of New Jersey. This Brotherton tract in some of the records is called Edgebillock, and is the same more recently known as Edgepelick. From a statement contained in the history of Byberry, Pa., it seems that these Indians, like many persons in our day, enjoyed an occasional outing from home. For a number of years it was a custom for some of them to visit Byberry every spring and occupy an orchard, where they erected wigwams and spent the summer. They were very peaceable and inoffensive, and employed themselves in making wooden trays, barn shovels, barrels, and baskets. They were fond of hunting and fishing, and among the game they captured were the common land tortoises. They would cut timber without license from the owners under the plea current among them, that when the Indians sold the country to Wm. Penn they reserved the privilege of cutting basket stuff. In the journal of John Hunt, a minister who resided near Moorestown, N. J., under date of First Month 22d, 1777, he says: “I went with my friend, Joshua Evans, to see the poor Indians at Edgepelick, and we found them in very low circumstances as to food and raiment. Joshua took them a considerable parcel of old clothes, with which the poor naked children seemed exceedingly pleased. He had also collected a number of blankets for them, and obtained money, with which he bought corn for them. This he did, because these poor creatures are too apt to lay out their money for strong drink. This visit to the Indians was an instructive lesson to us. Though they were poor, there seemed to be innocency, unity, quietude, and peace among them, even at a time [the Revolutionary war] when it was so much otherwise with the white people. Amongst the elderly women there were countenances that bespoke gravity, humility, innocence, and tranquility. “This visit was very satisfactory to me, though it caused me to think how lavishly some feed and pamper their horses with corn, while the poor Indians are so needy; yet are they on the whole as happy and contented, if not more so, than we are, and as likely, for aught I know, to answer the end of their creation. “First Month 2d, 1778. Joshua Evans and I went again to Edgepelick to see the Indians. We found them in a very poor, suffering condition as to food and raiment; but as to quietness and peace, they seemed much happier than many of the white people who were rich and abounded with plenty, yet were disquieted and afflicted in mind, because of the great destruction there was in the land. “Twentieth. Joshua Evans and I went up to Indiantown to carry some blankets and old clothes, which Friends had bestowed to the Indians ; and the poor, almost naked creatures seemed to receive them with abundance of thankfulness. On the 4th of Seventh Month, 1802, John Hunt mentions that he was at a meeting appointed for the Indians at Edgepelick, who were about to remove to Oneida. There is interesting evidence that these visits were appreciated by the Indians in an account of a visit paid in 1842, by some Friends, to the Indians residing near Fort Leavingworth, Missouri. They met with an aged Indian woman named Catharine Everett, who told them that, when a child, she lived at Evesham, New Jersey, and that she was well acquainted with Friends; and said she knew that dear old Friend, Joshua Evans, the man who wore a long beard. She said she thought him the best man in the world, he was so very good to the poor Indians. Our visit to this classical locality was made under favorable circumstances. Two bright and intelligent young women formed part of the carriage-load, and enlivened our journey by their enthusiasm and their remarks; and our kind host was a born woodman and familiar with “the Pines” from childhood. About the time the Indians had removed to New York State the New Jersey authorities directed the land to be surveyed and divided into farms of one hundred acres, and sold for the benefit of the Indians; and some of this land had descended to him from his ancestors. A few miles below Medford we crossed a low ridge, which marks the dividing line between the branches of the Rancocas, which flows westward into the Delaware River; and those of Mullica River, which flow eastward more directly to the ocean—the common receptacle of all the drainage. One of the first points of interest was a bushy bog, the source of Edgepelick Creek, which itself is a branch of Springer’s Creek, so named I suppose, from the family who formerly owned an extensive tract of land in that section of the country, and from whom the Indian reservation was purchased. As an illustration of the loose manner in which the surveys were made in early clays, when land was held at very low prices, it may be mentioned that a re-survey showed the purchase to contain more than one thousand acres beyond what had been previously estimated. While much of the land was too poor to be profitably cultivated, yet there was a considerable body of productive land on the reservation, and the fields of corn and grain looked well. It contained some cedar swamp, which is valuable in New Jersey for the timber it yields. The White Cedar (Cupressus thyoides) is an evergreen tree, with very small, scale-like leaves. It is a native of the swamps, and grows where its roots can be always bathed in water. The plants come up so close together, that in their effort to reach light and air they shoot up tall, straight and slender, with no branches or foliage, except a little cluster at the summit. The wood, although soft, is exceedingly durable, and will last almost indefinitely without rotting. It must not be confounded with the Arbor Vitæ, which is sometimes called White Cedar, but which is a more northern tree. During the day’s ride we visited several Cranberry bogs—some of which were heavily laden with berries, giving promise of an abundant crop, if no accident or disease should befall them. The essential feature of a good bog, is a low, swampy piece of sandy land, with a stream of water running through it, so that by the erection of banks and dams, the owner can flood it at pleasure. In making a new one, it is customary, after erecting the banks, to flood the land for a year or two, so as to kill the natural growth. Often a coat of sand is then spread over it, and the cranberry vines are planted. A situation which is naturally springy, seems to favor the growth of the plant. The Cranberry belongs to the same genus as the Blueberries, or Blue Huckleberries (Vaccinium). It is the V. Macrocarpon, “large-fruited,” so called because its fruit much exceeds in size that of the other species of Vaccinium. It differs also from them in this respect— that it is not an upright shrub, but a creeping vine, which trails on the ground from one to three feet, and sends up numerous short branches on which the flowers and fruit appear. It was an interesting sight to see many of these branches already so thickly covered with berries. The amount of laud suitable for cultivating the Cranberry is comparatively small, and one desirous of establishing a plantation might be compelled to purchase a large tract of adjoining land, so as to control the water privileges and other surroundings necessary for his purposes. Rattlesnakes are occasionally found in the New Jersey swamps, especially in the vicinity of clear, running water, or springs, but they are not abundant, and one may frequent such localities for years without encountering one. In the early settlement of this country they were comparatively numerous. But the war waged on them by the farmers, and the attacks of the hogs running in the woods, have greatly diminished their numbers. They are still frequent among the rocks of the Alleghanies, but in the country lying between those mountains and the New Jersey swamps, can scarcely be said to exist. The location of the old Indian burying ground was pointed out to us—a piece of unenclosed land adjoining a school-house. We were still more interested in calling on a survivor of the New Jersey Indians, an aged woman named Ann Roberts, or Indian Ann. She seemed in good health, but feeble, and lived in a comfortable frame house which, we understood, belonged to her. She thought she was upwards of one hundred years old, but one of her neighbors estimated her to be not more than ninety. She was brought up in the neighborhood of Rancocas, but on her marriage moved to Edgepelick, which had now been her home for many years. It seemed to please the old woman to hear about a son, who was known to one of the women, by whom she sent him a message. In the circuitous route we took, we often traversed narrow roads through the woods, where our driver seemed as much at home, and ascertain of his route, as in the more open country.